It’s 3pm on Sunday and as we drive past a car garage, the husband decides on a whim he might want to buy a new sports car. This is classic behaviour for a man who has just reached 35 years of age, I think. So, for now, I am going to play along. We enter the Porsche garage and the husband immediately sets about sizing up the car he’s after. I’m not sure what car it is exactly but it has the word ‘turbo’ in its title. My limited experience of luxury car garages is that unless you arrive in a chauffeur-driven Bentley, wearing shades and lots of bling, you largely get ignored. When the husband wanted to buy his last car three years ago, he walked into Leeds Audi to hand over the readies – and simply couldn’t get anyone to serve him. This happened on two occasions and eventually we were forced to drive to Wakefield Audi, where there was no end of car salesmen queuing up to help us. Unfortunately, the one we ended up with was called Julian and had recently recovered from a nervous breakdown. Here’s what we learnt about Julian: he has a phobia of tomatoes and instantly shakes and vomits at the sight of them; he can’t stop biting his nails; he appeared to know nothing about the cars he’s attempting to sell. In fact, Julian was so useless that for some unfathomable reason, he forgot to input any of the husband’s optional extras onto the computer system so that the regional manager of Audi actually had to phone through to the production line in Germany to sort Julian’s mess out. Still, we grew very fond of Julian and talk of him often. The husband is still planning on sending him an anonymous crate of tomatoes in the post as a thank you. Back at the Porsche garage, in true form we stand around for about half an hour, patiently waiting for someone to see us. Eventually, the manager disappears into the back room and re-emerges with the most hapless salesman he can lay his hands on. This new simpleton goes by the name of Vinnie and is a thinner, more pudding-brained version of Vinnie Jones. Inevitably, Vinnie has only just started working at Porsche and knows nothing about the model the husband is interested in. We say goodbye to Vinnie and climb back into the car. The husband concludes that although he likes the Porsche, he thinks he still likes his current car more, even though it is exceedingly dirty. We arrive at the gym and I hand the keys over to the guys at the car wash.
An hour later, we exit the gym. Now that it has been washed and is gleaming again, the husband decides that he still loves his old car. Having the car washed is the best £5 we’ve spent this year. Still, I decide to surprise the husband with new number plate. 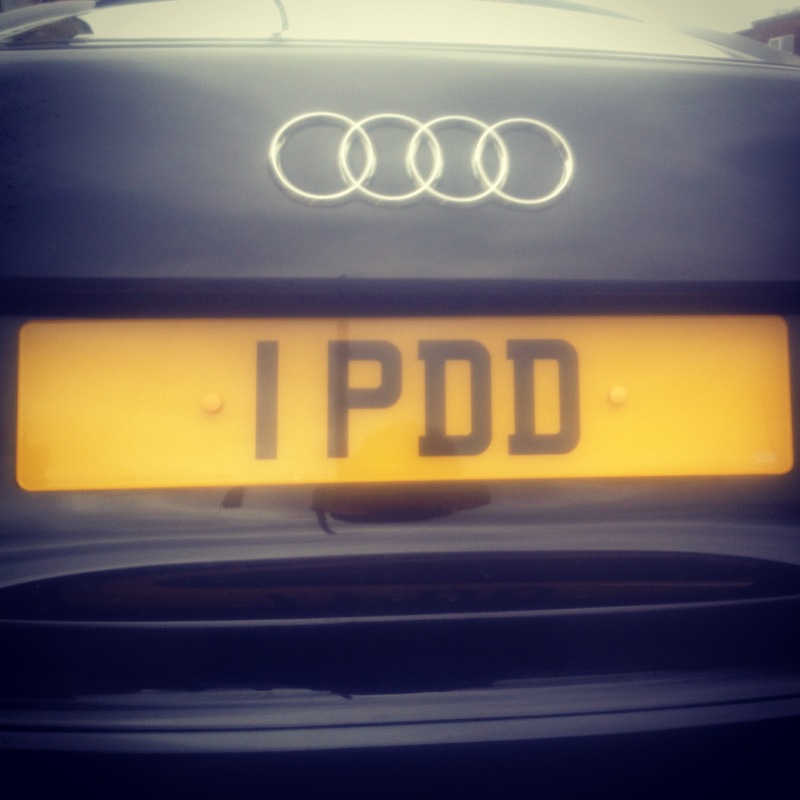 This may be a foolish move, as the husband doesn’t like showy personalised number plates. After a lot of delicate negotiating on the phone with a man called Dean (Mean Dean! ), I finally close a deal on a plate with the husband’s initials. There’s a reason I call him P Diddy and it’s not just his love of shower puffs. 1 PDD arrives in the post two weeks later. I proudly unwrap it and present it to the husband. He squints at it for a while. ‘From a distance, I think it looks like 1 POO,’ he says. ‘I know what you mean,’ I said. ‘In fact, it looks more like ‘I POO’, he adds. ‘It’s not that bad,’ I said. ‘After all, everyone DOES poo. ‘I’m going to be driving around in a car that announces to the world I POO,’ says the husband, shaking his head. Sometimes you just can`t win, so long as you keep trying, thats what counts. I’ve just snorted with laughter reading this.